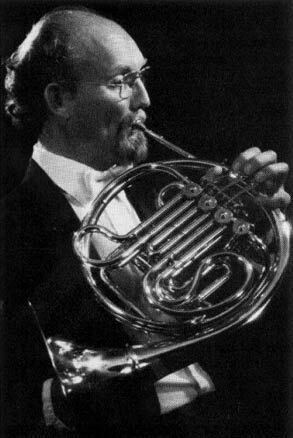 Charles (Chuck) Kavalovski retired in 1997 after serving as principal horn in the Boston Symphony Orchestra for 25 years. He won this position with an unusual background for a horn player – a PhD and career in nuclear physics, and playing only in chamber ensembles and community orchestras. While teaching nuclear physics, he decided he wanted to see what he could do for a career as a horn player, so he took and won several auditions for principal horn. He played first horn in Denver for a year, during which results from other auditions came in, including first horn in the Boston Symphony, the position he took the following season. Chuck was born in 1936 in St. Paul, Minnesota, the oldest of five children of Polish immigrants who wanted to give their children an education and musical training. His mother insisted he take piano lessons, which he hated. When he entered high school, his mother bought a Pan American single F horn and said that if he played the horn, he could quit the piano. His college education led to a master’s degree in mathematics and another in business administration, plus a PhD in nuclear physics. Music was primarily a hobby, but he studied privately with the successive principal horns of the Minnesota Orchestra: Waldemar Linder, Christopher Leuba, and Robert Elworthy. In fact, he found a high correlation between science and music, and he and his colleagues in the Physics Department formed a wind quintet. Chuck was on the physics faculties of the University of Washington in Seattle, University of Lowell in Massachusetts, now the University of Massachusetts-Lowell (while doing research at MIT), and Eastern Washington State College in Spokane. He has taught horn at Boston University and the University of Minnesota. He recommends a daily routine for all players, including spending time on fundamentals, starting every day learning to play the instrument over again so that technique does not deteriorate. "I've been lucky to have two careers," he comments. "In this day and age, you have to specialize. I loved physics, but I also wanted to play the horn. Fortunately, I've been able to do both." He is also lucky, he says, "to have had the best horn job in the US." The BSO has the best hall, good management/orchestra relations (no strikes), and Ozawa was flexible with scheduling. Chuck had a say in hiring everyone in the section, and they were great colleagues. Boston is the "easiest large city to live in," the orchestra has summers at Tanglewood, and Chuck particularly appreciated the BSO Chamber Players, a unique arrangement for the first chair players, who don't play Pops. Boston also has a wonderful tradition of a public attitude that respects musicians as much as it does, for example, physicists. Discipline helped Chuck recover from a serious fall off the roof of his house, landing on his head. He has no long-term effects, but for several months he was physically debilitated and could not move much. He pushed his recovery, walking before he was supposed to be out of bed, for example, starting slowly on the horn but then increasing his pace. The BSO audition committee members were not sure they wanted to hire someone with a degree in nuclear physics and not much orchestral experience. They asked him to sight-read something and he responded that, if he won the job, he would never be sight-reading for them. They let him take the piece, practice it for an hour, and return to play it. He began his BSO tenure at Tanglewood and practiced on his apartment balcony in the rain and sun during the weeks before the summer series to prepare himself for the weather. He explained that he won all the jobs he did and performed so well for years in the BSO because he knew how to study – he was an excellent student. Since retiring from the BSO, Chuck recorded 14 CDs of Reicha quintets with the Westwood Wind Quintet, until back problems forced him to retire again. Chuck most often played a Geyer, Kruspe, or Schmidt horn and sometimes a Paxman descant. When he retired he owned over 20 horns, explaining that one good violin cost more than that. Chuck served on the IHS Advisory Council (1994-1997) and was a featured artist at several international workshops. He was elected an IHS Honorary Member at the International Horn Symposium in San Francisco in 2011. Interviews with him have appeared in the November 1976 and February 1998 issues of The Horn Call.